This process is used to resample, or decimate a set of existing checkshots. Checkshots are generated spaced at regular MD intervals based on a source of velocity data, starting from a manually entered time-depth pair. Some of these checkshots may be removed if they are not required to achieve a specified level of accuracy in TWT. 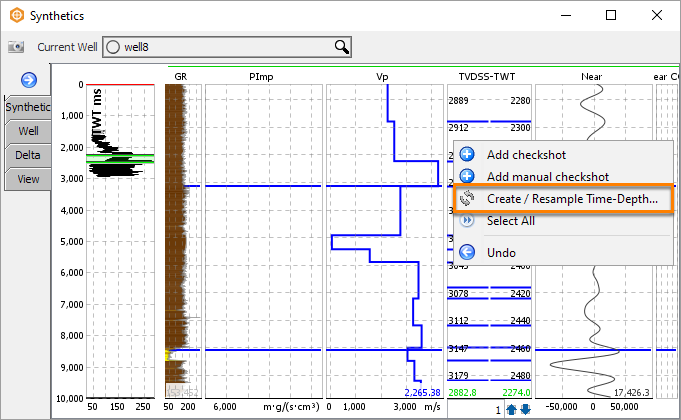 Set the time-depth survey to resample as the default time-depth pairs in the well. From the Tool menu in the Control Panel, open the Synthetics view. Right click on the T/D Pair Track. Either resample the current T/D pairs or tick the Create New Time-Depth Survey option to create a new survey. Note: When creating a new survey, a unique name must be provided. Input an Initial Time-Depth Pair that must fall within the range of existing checkshots. At Interval (MD), insert a minimum MD interval between consecutive resampled checkshots. Define the Accuracy (ms). Pairs that affect time-depth conversion below this amount are excluded.